This luxurious seasonal pedicure is an hour well spent with our custom selected FarmHouse Fresh products to help both soothe and uplift you. This pedicure includes a fizzing bath bomb and sweet cream exfoliation. You will then be given a chocolate mask to nourish the skin revealing smooth skin. Finally, finish with a lightly scented shea butter with scrumptious white velvet cream and moist layer cake. Yum! This manicure will leave you feeling youthful and full of sweet thoughts. After nail and cuticle work a nourishing and antiaging chocolate mask is painted on leaving your skin feeling rejuvenated. Finishing off with a relaxing hand and arm massage with the most wonderful Whoopie Cream shea butter; leaving you smelling and dreaming of white velvet cake. Well-cared for nails are an essential part of everyday grooming. Our team of professional nail technicians will take care of your nails in our beautiful and clean environment. You will leave feeling relaxed and refreshed with a meticulously polished manicure or pedicure. Every nail care service includes your aroma selection of choice and a relaxing hand and arm OR foot and lower leg massage depending upon your service. Service times may be slightly shorter then booking time as listed below. Series Package of four of the same service treatments at a savings of 12%. Series Package of seven of the same service treatments at a savings of 15%. Standing appointments to ensure preferred date, time and technician. Ask about our seasonal pedicure! Open-toed sandals are recommended for pedicure services. Please do not shave within 24 hours of your pedicure service to avoid irritation. You are welcome to pre-pay for your services when you arrive if you do not have time to wait for your nails to dry. We proudly use OPI and are CND certified to provide Vinylux™ and Shellac™ services. For sanitary purposes, we ask that guests refrain from bringing in their own polish. This express version of our spa service includes basic nail & cuticle care, an application of Hand ReliefTM & polish for the on-the-go guest. This express version of our spa service includes basic nail & cuticle care, an application of Foot ReliefTM & polish for the on-the-go guest. 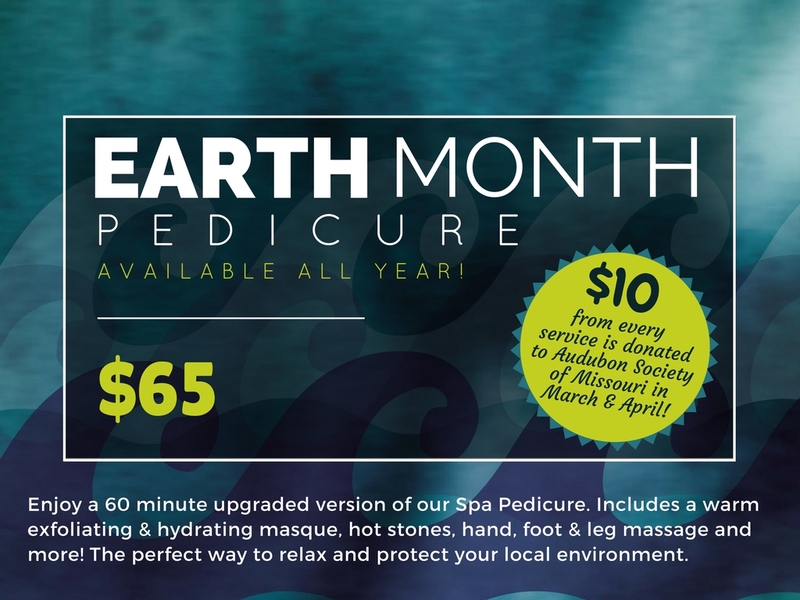 Enjoy our Earth Month Pedicure while supporting the Missouri Audubon Society. $5 from this service will be donated towards our Earth Month Fundraising efforts all year long. This upgraded version of the 60-minute pedicure provides an exfoliating mask, warm hydrating mask and hot stones, while incorporating hand, foot and leg massage. A perfect way to relax! Award winning CND Shellac™ guarantees brilliant results. Up to 14-day wear. Mirror finish and no dry time. Award-winning CND Vinylux™ guarantees brilliant results. 7+ day wear, mirror shine & 8-minute dry time makes this a perfect add on to every pedicure or manicure service. This seasonal manicure includes a juicy cocktail scrub that is full of fresh raspberry notes, organic vodka, raspberry extract, sugar, and rice bran oil. This creates a sweet exfoliation that brings super softness to skin. Then followed with a Front Porch Punch shea butter infused with strawberry, peach, mango and melon. One whiff and your mouth is watering! The supple butters and vitamin-E packed jojoba and soybean oils calm even the severest of dry skin, without feeling greasy or heavy. Cozy up! The service begins with a warm vitamin E-infused Bananas Foster bath fizzer to soothe skin irritations and winter dryness. The skin is then prepper with a delicious brown sugar and Kentucky whiskey scrub- an absolute dream for winter parched skin. A chocolate fig mask is applied, giving skin a toasty drink of vitamins A, E, and K. Finishing with a dose of “youth” in a feathery, peptide-rich body mousse called Moon Dip. Unwind as the peptide-enriched emollient oils deliver hydration with notes of dreamy oats and milk. A deep moisturizing treatment using Aveda products to lock in your skin's natural oils. Heated stones are incorporated to increase warmth and circulation, induce deep relaxaton, and bring body and mind into balance. Enjoy a moisture-free exfoliation of the lower legs and feet with specialized spa gloves. This experience not only exfoliates but warms the circulatory system and increases lymphatic flow. The gloves are yours to keep for home use with your favorite Aveda cleansers. This peel can be added to manicure services only and helps improve skin’s texture and the appearance of age spots. 15 minutes is added to your service time. Reveal softer, smoother skin with our Spring Enhancement provided in March, April & May. Aveda’s Skin Refiner along with the Radiance Masque will slough off dry skin and get you ready for sandal season. Enjoy a cold glass of Comforting Tea with your service.